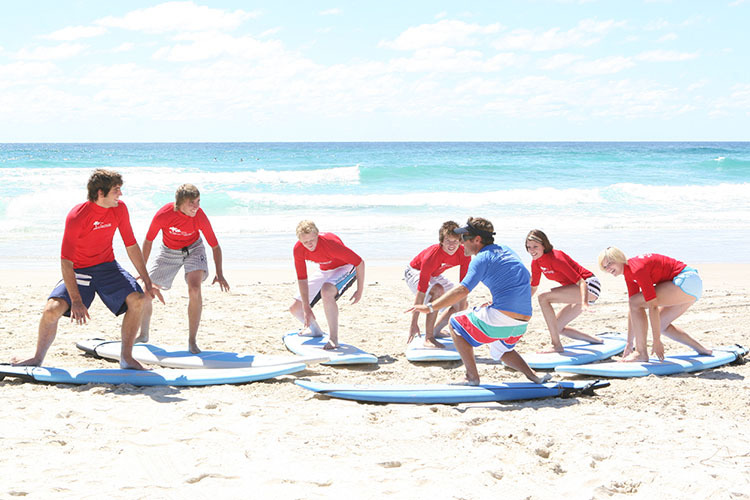 Surf in Paradise is a Gold Coast surf school that holds surfing lessons for adults of all levels and ages. Adults who have a surf lesson with our surf school can learn to surf in the best location for beginners on the Gold Coast, only 10 minutes from Surfers Paradise. You will only ever have a maximum of 5 other people in your surf lesson and whenever possible we always try and separate the kids from the adults, so those loose limbed youngsters don’t make us feel like uncoordinated giraffes. We make sure you surf the best waves, with the best instructors, teaching using the best techniques, so that we can guarantee that you will stand by the end of your first lesson or we will give you a second lesson for free! These are the ultimate introduction to surfing as the surf instructor can run the surf lesson to suit your own individual ability. You get the complete safety, advice and encouragement from a surf instructor who is beside you the whole time. We can specifically target areas to help improve your own individual technique. We find that clients who choose private surf lessons tend to progress at a faster rate. We also offer discounts on additional private lessons. stand up using the easiest technique for your own level of agility. If you find you enjoy the group lesson and want to progress further then you can purchase one of our lesson packages. These surf lessons are great value and if you want to make surfing a regular activity in your life and progress further, then the surf lesson package is for you. Our lesson packages are not just a great way to learn how to surf but they are also a great way to meet new people who share the same enthusiasm for trying something new and fun.